Fit review day today! Sorry I’ve been MIA with fit reviews in the last little while, it’s been a bit hectic around here. I will do better!! On Tuesday I mentioned that I went a bit crazy ordering the Bring It Backbend Sweater and a few other items. 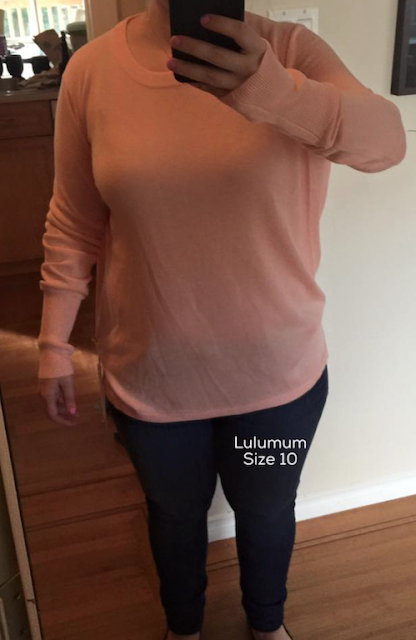 I ended up ordering my size and a size down in the Minty Pink sweater, and my size down in the black. I definitely feel this is a size down item because even in the 8 it is wide in the chest and still quite long. Both sizes I could pull the back down and keep the opening closed, or I could wear it higher on my hips and have it stay open. You are not sacrificing a relaxed slouchy fit by sizing down in this, and the TTS may even be a little too big on you if you have narrow hips and shoulders. The pink and black both sold out online but my store had these in today (Coquitlam Centre/BC) and so you still have a shot of picking one up in store if you are in Canada, or ordering by phone from a Canadian store. I like this sweater but honestly I cannot say I am in love with it. My main hold back on loving it is I feel the front is really plain and the crewneck is high so it feels really plain in the front. Usually with oversized sweaters like this you get a really pretty and flattering neckline that shows off your shoulders or your neck to make it still interesting and feminine but this is just an oversized knit from neck to hip. The material is lovely and the color is lovely so I’m inclined to keep one but I don’t feel this is a knock out like the Chai Time Sweaters are. I’ll have to think about it. As far as the color, I really love Minty Pink a lot. It’s such a vibrant and interesting peach/pink. Unfortunately I think it may wash me out a bit and the color is pale enough that it’s slightly sheer. The black was definitely more elegant on. What do you guys think? 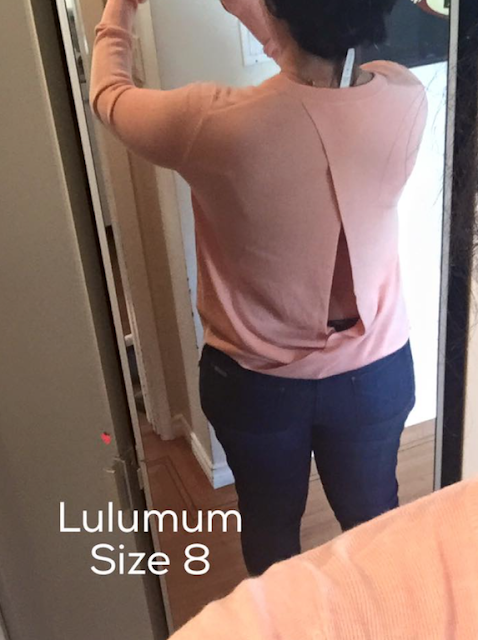 Did you also order the Bring It Backbend Sweater and have a fit review to share with us? "Fit Review: Love Tee II, Salute The Sun Singlet II"
What did you think of the align tights? I like them. I think the 10 was the right call on sizing for casual wear. I'm just worried about them pilling and they feel really delicate and unsubstantial. I'm torn on wether or not I should keep them since I don't tend to wear my leggings casually very much. I really like how matte and dark they are though. Remember your KonMari mindset LLM and don't keep anything that doesn't immediately spark joy. The fact that you are unsure says you don't love it right away. Only keep the items you rip the tag off right away and wear! I think I like size 10 better on you, but I tend to like loose fit tops. I agree with you about the neck line, they should have done something more interesting . Is it scratchy at all? I got this one and was disappointed, it will go back! Nothing special in my opinion for a hefty price tag. I was hoping for more. Meh. Save your $$$ for something that makes your heart flutter. We don't need Lulu just because it's Lulu… And Lulu needs to learn that. So true. The porcelain CRB made my heart flutter, and the blue love tee. This sweater did not. Definitely leaning that way! Thanks! I like the size 8 on you best. I have to agree with Anon 6:43, even though it's Lulu I have to really love everything about it, especially if the price tag is steep. If you are keeping it, the 8. The 10 is shapeless and too wide – too much spare material under the arm area. The 8 flatters you more than the 10. You are spot on with your observation about the neckline – boring crew neck. They missed the mark there even though it is pretty in the back. If you don't completely love it, return it. So disappointed how this sweater looks. I agree with what the others said, size 8 looks best on you. Front is really plain and doesn't do anything.they could have added some lacy holes like they did in that laser cut shirt, to give it some detail and it would have looked sweet with the pale pink color. I got this in black in a size down. I guess I'm in the minority because I like the simplicity of the front combined with the interesting back. I do think that if you keep it, you should stick with the 8. I got this and sized down. It's still loose after the size down, but I love it! I've gotten a lot of compliments on it. I agree about the front; however, I'm glad it's simple because of the back. The only thing I would change would be to make the neckline a bit lower. I tried it on in store and preferred the size down on me. On me, the back didn't gape open in either size – it stayed over-lapped even when I bent over. Like you, I didn't "love" it. From the front, the appearance is too similar to the Sunshine Coast sweater which I already have. (Though the SC sweater is more fitted). If they had my size in the pink, I probably would have purchased it and made the decision on keeping it later, but my store only had black & grey left in my size down. I am in the US and curious about what the price is for this sweater? Do you prefer the fit of this sweater or of the sunshine coast long sleeve? Agree. It's nothing special. 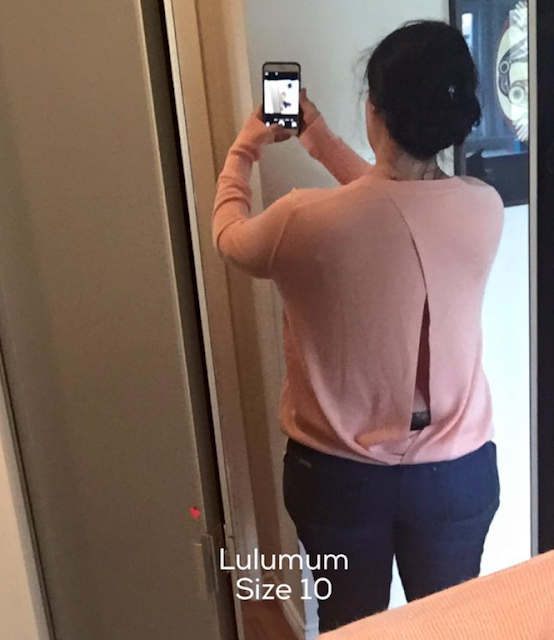 You don't have to buy/keep it just because it's a Lulu. If you don't love it, leave it. I got my size down in both black and pink from our store yesterday, and I love! I like the simple yet classic looking, plus you can match with more fun patterned bottoms from Lululemon. 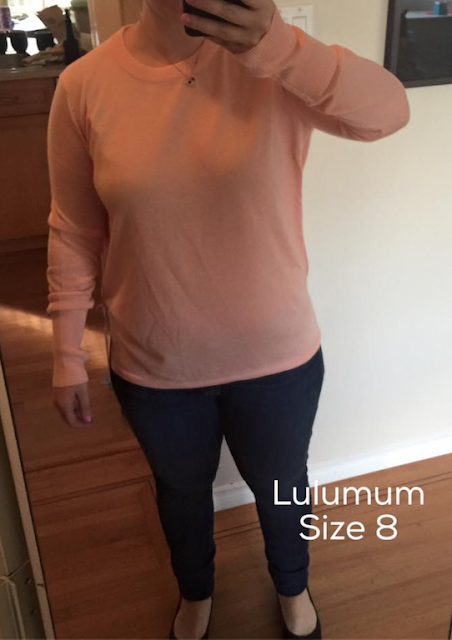 LLM – what did you end up deciding on these sweaters? Hey LLM! What did you end up deciding on this one?